Colchicine is a controversial medication due to its poisoning properties and potential side effects. Despite the benefits of this drug, some side effects, both common and severe, have been noted. Common side effects can include stomach pain, nauseas, and diarrhea, while more serious side effects may include bleeding, seizures, or severe stomach pain. Allergic reactions can also occur when patients consume colchicine. A description of these potential adverse reactions and side effects, as well as tips regarding when to consult with a doctor, is discussed below. Many medical professionals and organizations encourage that other medications and treatments be used with elderly patients. This is because the elderly population may be more susceptible to cumulative toxicity with colchicine or Colcrys, and this can be attributed to age-related renal function impairment. It is thought that other types of treatments involving corticosteroids should be considered and may be a better option. If there are no other options available and Colchicine is prescribed for an elderly patient, they should use lower doses and should take no more than 3mg of the drug over a four day period. 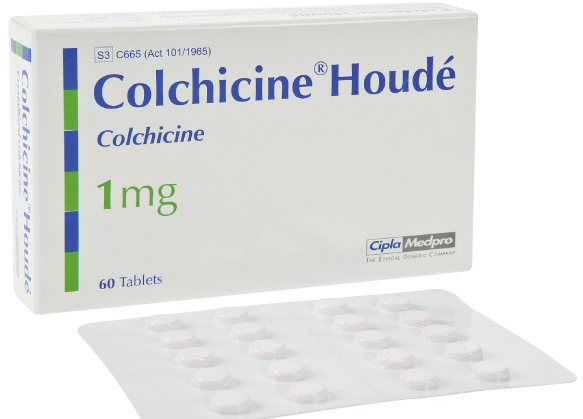 Colchicine has had previous success in the treatment of gout, familial Mediterranean fever, and other impairments. Despite its successes, various side effects also exist, and these side effects can have a variety of negative reactions on the patient. The drug’s toxicity makes it especially dangerous, and risks of overdose are also associated with its consumption. Patients should be sure that their doctor and pharmacist know about any possible drug or disease interactions before taking this medication in order to prevent the more dangerous interactions and colchicine side effects.